Mappiness is a free iPhone app that helps you manually track your happiness, relaxedness and awakeness in different situations over time. 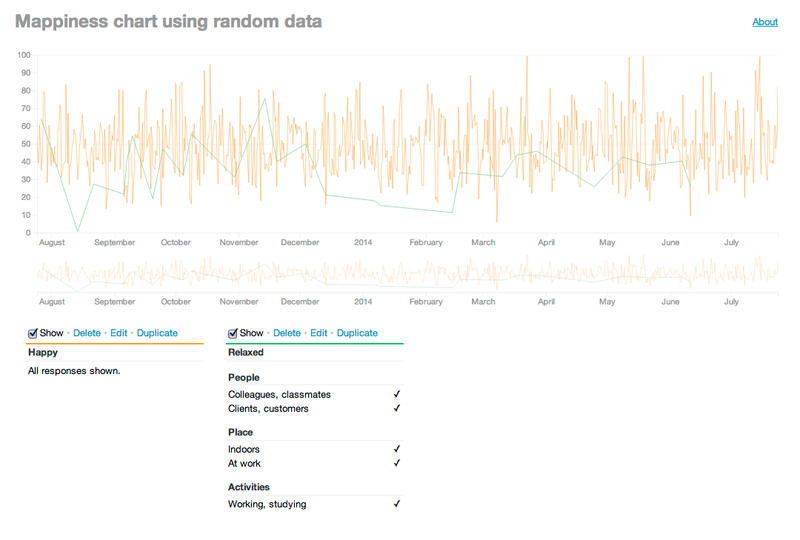 I’ve made a tool that helps users examine their data more closely (or you can try it out with random data). 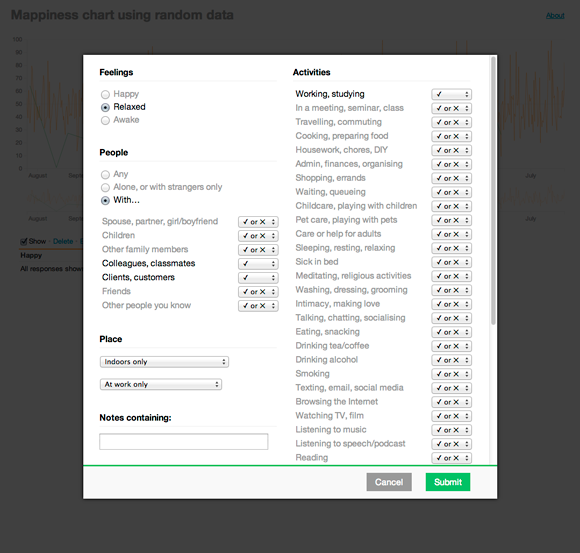 The Mappiness app itself shows a series of graphs of your data but these don’t allow for detailed analysis of the data. And, once you’ve been using the app for a long time, there’s too much data to see clearly on phone-sized charts. However, the app gives each user a code that allows them to download their data in a variety of formats from the web, so I decided, as another exercise in using D3.js, to make my own chart. To see more detail in the large chart, you can use the small “brush” or “scrubber” chart below to select a region to zoom into. 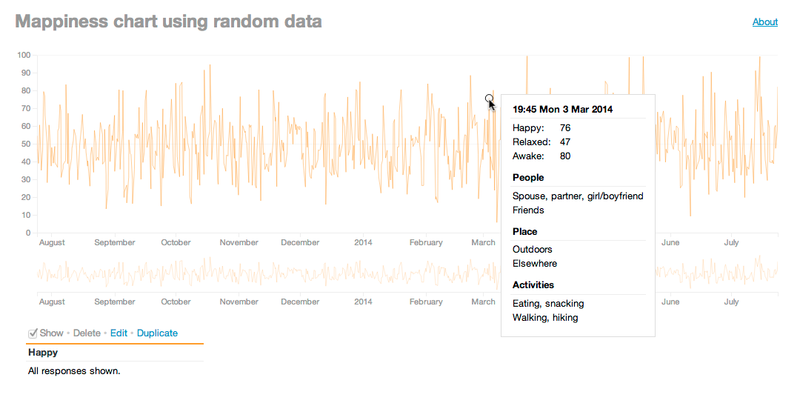 Very useful when you’ve accumulated a lot of data; this chart shows a year’s worth of data, but I have nearly four. But still, this does provide for much, much more fine-grained analysis of one’s data, which is surely the point of “life-logging” tools like Mappiness. 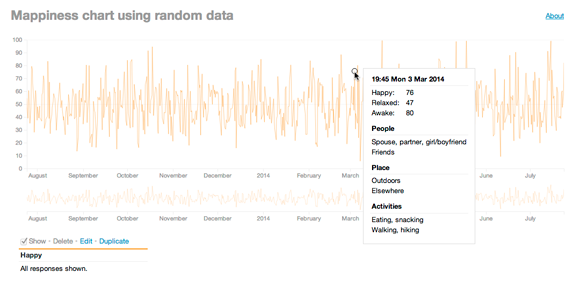 There’s no point collecting all this data without reflecting on it in aggregate. Am I more happy at work or home or elsewhere? When listening to music or not? Do I actually enjoy watching TV? Of course, we have to be careful not to confuse cause and effect — maybe I only watch TV when I’m fed up, rather than TV making me fed up. And the fact that one of my most happy-making activities is apparently drinking alcohol is more a factor of the occasions in which I do it: when chatting with friends. So, if you use Mappiness, or are just intrigued, give it a whirl. I’ve also written more about the process of building this.